There are two major sources of nonindustrial organic pollutants, namely human settlements and agriculture. In many developed countries, where the practice of sec ondary treatment to oxidize and disinfect urban sewage has been widely adopted, organic loadings are normally well contained. However, where intensive agriculture and animal husbandry is practiced, normally requiring sup plements of external foods, organic loads are raised. Even mineralized effluents promote ongoing and serious pro blems associated with eutrophication, where the production of biogenic materials in receiving waters is stimulated by the inorganic nutrients released. Moreover, even where tertiary treatment is applied to remove a substantial part of the phosphate content of treated sew age, the contribution of diffuse, nonpoint sources from agricultural land is often sufficient to support aquatic uptake demands and eutrophication problems persist. The responses ofbiotic communities ofimpoundments to water level fluctuations also affect the perception of water quality. Drawdown of the water level increases the relative depth range in which net positive photosynthetic production can occur and thus leads to a higher potential biomass of phytoplankton. It is a fact that as impoundments are drawn down during summer droughts to meet higher water demands, the quality of the stored water may deteriorate simultaneously and require more extensive treatment. There may also be attendant changes in phytoplankton species composition, as diatoms are replaced by potentially toxic cyanobacteria. More persistent drawdowns increase the relative area amenable to macrophytic growth. Furthermore, grass and scrub growth on exposed sediment and, in some cases, the grazing stock which it attracts can pose quality problems when the land is once again inundated. A perennial threat to impoundments is the accumula tion of silt generated as a consequence of soil erosion and inappropriate land management. Rates of erosion (and, hence, siltation) are generally recognized to be greater in arid and semiarid regions but exposed soils on freely draining slopes are a persistent source of entrained sands and silts. The rapid accumulation ofinwashed sediment at the lake bottom, at rates measurable in centimeters per year, can shorten the life of small impoundments along the course of sediment rich rivers to a few decades. Clay and other fine particles washed from catchments cause water quality problems in some types of impound ments as a consequence of the fact that they do not sediment, or at least, they are kept in suspension for long periods and are readily resuspended thereafter. The fact that turbidity may restrict excessive phytoplank ton growth is offset by its interference with zooplankton feeding and restriction of fish predation, and which thus contribute to reduced biodiversity. Moreover, the costs of treating turbid water for potability are high, not least because of the problem of sludge disposal. Inwashed particles also carry latent risks of pollution by toxic minerals. Whether loads are generated by mining or quarrying and the erosion of unconsolidated spoil, or result from industrial processing, there is an additional concern about the transport and sedimentary accumulation of toxic metals. 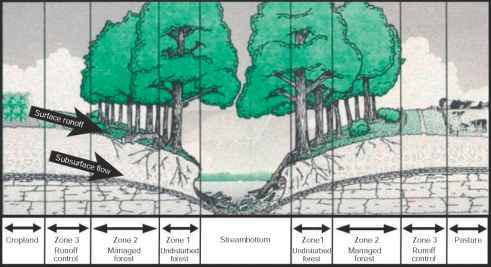 Impoundment sediments act as traps, but problems may be expressed later when changes in acidity or especially redox potential lead to mobilization. Health and safety issues raised by microbiological qual ity challenge the supply of wholesome, potable water from impoundment storage. Current difficulties are presented by such protistan parasites as Cryptosporidium and Giardia whose spores are resistant to chlorine disinfection. Water quality is also threatened by the climatic changes predicted as a consequence of global warming. Altered water balance, heat fluxes, and precipitation patterns will affect the dura tion and stability of thermal stratification, and diminished deep water ventilation owing to lengthened stratification will lead to lower oxygen concentrations in impoundments.